Biologists with the New England Aquarium are investigating what may have caused a rarely-seen deep water whale to wash up on a Massachusetts beach. The carcass of the 17-foot female, weighing almost a ton, was found Friday on Jones Beach in Plymouth. Aquarium biologists and staff from the International Fund for Animal Welfare are performing a necrospy at the Woods Hole Oceanographic Institution. 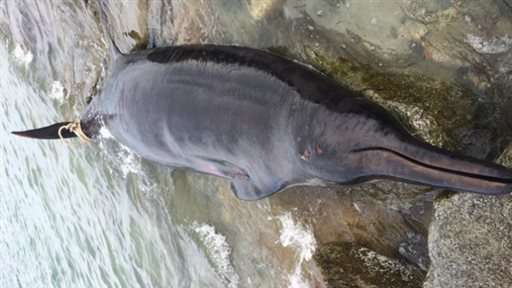 They believe the whale is a Sowerby's beaked whale, but the aquarium hasn't handled a beaked whale since 2006. Several species of beaked whales are found about 200 miles offshore in the North Atlantic. The whales have long, slender snouts and feed in cold, deep water on small fish. Commercial fishermen sometimes net them accidentally. The carcass offers a chance for biologists to learn more about them.